Veteran's Day is this coming Sunday, November 11, with the holiday being observed by businesses nationally on Monday, November 12. For those who have served or are serving in the military, and sometimes their family members, Veteran's Day is a good opportunity to take advantage of being involved with the military through national sales and local freebies. 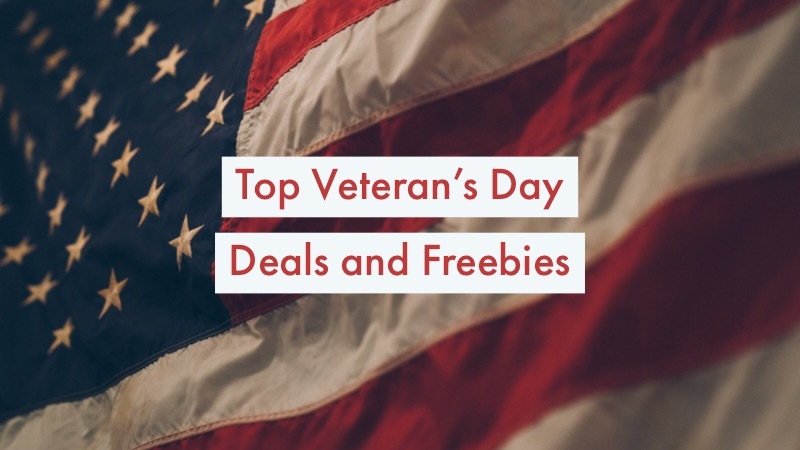 Let's take a look at some of the best Veteran's Day deals being offered this year! Also be sure to visit Coupon Cause for a full list of regularly updated Veteran's Day 2018 deals. Eat'n Park: Active and former US military receive 10% off all month! Spaghetti Warehouse: BOGO entrees all Veteran's Day weekend, November 9 - November 11. Famous Dave's: Former and active military receive FREE two meat combos from Famous Dave's on Sunday, November 11 and Monday, November 12. Shane's Rib Shack: A free sandwich, side and drink are offered free to former and active military Friday through Sunday of Veteran's Day weekend. Red Lobster: Limited time Veteran's Day menu available includes a free appetizer or dessert for former and active military and reservists. Must present military ID to receive on Sunday, November 11. Applebee's: Veteran's Day menu includes a free item for former and active military on Sunday, November 11. BJ's Restaurant: Receive a free entree up to $12.95 with military ID. Also receive a free beverage. Available on Sunday, November 11. Buffalo Wild Wings: Veterans and active military can visit Buffalo Wild Wings on Sunday, November 11 and receive an order of wings and fries for free. California Pizza Kitchen: Special Veteran's Day menu will be available for active and former military, including a free pizza, salad or pasta, on Sunday, November 11. Chili's Grill & Bar: Free meal available for veterans and active military from a limited time Veteran’s Day menu on Sunday, November 11. Cracker Barrel: A Crafted Coffee or Double Chocolate Fudge Coca-Cola Cake is free of charge Sunday, November 11. Dunkin’ Donuts: Visit Dunkin’ Donuts nationwide to receive a free donut on Sunday, November 11. Hooters: Former and current military receive a free Veteran’s Day menu meal with military ID on Sunday, November 11. Little Caesars: Bring a military ID to Little Caesars on Sunday, November 11 to receive a free $5 HOT-N-READY combo for lunch. Max & Erma’s: Visit Max & Erma’s for a free cheesesburger, fries and drink with Military ID. Did we mention the fries are endless? Offer available Sunday, November 11. Primanti Bros: Former and active military can receive a free sandwich all day on Sunday, November 11. Texas Roadhouse: Veterans and active military can receive a free meal from the Veteran’s Day menu on Sunday, November 11. Claim Jumper: A special menu is available on Monday, November 12 for veterans and current military. One free entree offered with military ID. Golden Corral: Veterans and active military can visit Golden Corral from 5PM to 9PM on Monday, November 12 for a free “thank you” dinner. Sofamania: Save 12% off the entire Sofamania site with free shipping until November 11. Brayola: Former and active military save 10% off the entire Brayola site until December 31. HerbsPro: All orders over $49 are eligible for free shipping for Veteran’s Day. Champion: Veterans and active military receive 20% off all orders until November 12. Hanes: Save 20% off all orders until November 12 if you are active or former military. Eddie Bauer: Everything on sale is up to 50% off and eligible for free shipping if over $99 until Monday, November 12.